I’m home, and mostly recovered, from ISTE. Feels like a good time to take a minute and write about my thoughts on the conference. The simple summary is that I really enjoyed the conference and think it was totally worth while. That isn’t to say that the conference was perfect by any stretch, or even what I really expected. I went to ISTE feeling like I would leave with some new knowledge, some new idea that would transform my teaching. That didn’t happen. One of the biggest reasons for that is the sessions themselves were misleading. Many of the sessions I attending had really fascinating titles like “Create a tech startup at your school” or “Managing 1-to-1 as a Principal or Technology Specialist.” I went to these with so much hope that I would walk away a better teacher. Instead, I walked away from the tech startup one with ideas for how to make kids sell school surplus on ebay and how to pick the right device for a 1-to-1 school. 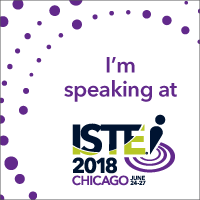 I was talking to a fellow teacher at ISTE and I made the comment “It’s like session title link bait.” Maybe the people running these sessions had grandiose plans when they named their session and just din’t deliver (which I definitely feel is true for the managing 1-to-1 session). Maybe it was intentionally misleading, or the host didn’t actually understand the terms they were using. Either way, I feel that the majority of the sessions were almost completely useless. What I did walk away from ISTE with is a list of people that know so much more than me. I met with people that I have talked to on twitter before (like Sherry Gick who is awesome, and I totally fanboyed over), and that was super cool. But what else I found were people who were already doing the crazy things I was thinking about doing,and doing them much better than I had planned. Especially in the Ignite sessions, I saw multiple teaches who have student-run tech support, and idea that I am already in process of implementing at our school. While their 5 minute talk didn’t give me every detail, it did show me that they are brilliant, and it gave me their twitter accounts so that I can call on them when I need help. The biggest thing I got out of ISTE though was the team building. 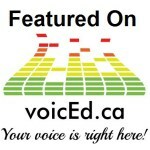 I went to this event with my principal and 4 other teachers on the Digital Curriculum Teacher Leaders team. These people, without exception, are awesome. We had so much fun hanging out after the conference each day, and in different meetings we all attended together. I have worried on occasion about how I was going to be able to manage such a massive campus (over 4000 students and over 200 staff) during a 1-to-1 transition year. I no longer have any concerns about that. I know that my school is setup for success because of the team we have built around this transition. They put this round of Ignite talks on the stage at the back of the show floor. This means that there were people talking loudly all along, not nearly enough seating (I was on the floor in the back), and at one point, an announcement was made over the PA system while someone was presenting. Ignite talks are hard enough, auto forwarding slides every 15 seconds, definitive timing, and generally less experienced presenters. This venue was simply not fair for the presenters. I learned a ton from the 2nd round of Ignite talks, but got completely cheated on the 3rd round. It was just too hard to hear them. 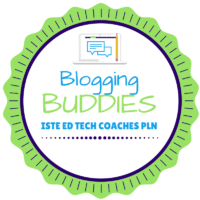 Huge mistake by ISTE.